Gastropods are a group of invertebrates comprised of snails and slugs as well as many marine and freshwater species belonging to the taxonomic class Gastropoda (meaning "stomach-foot"). They are the largest class of mollusks with 60,000-75,000 thousand species known. More than two-thirds of gastropods live in a marine environment. Most of the well known gastropods are terrestrial (land dwelling). Some well known gastropods are slugs and snails. Snails can be found on land or underwater. The most simple gastropods are the limpets and abalones, both of which are herbivores. One of the earliest known terrestrial gastropods was the Maturipupa, a modern day relative of the snail. 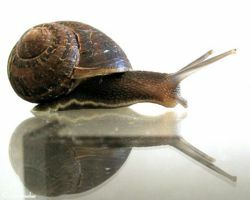 Gastropods consist of four main parts: head, foot, mantle, and visceral hump, as shown to the left. Snails are recognizable by torsion. Torsion is a process where the body coils to one side during development. Most of the time they will have a well-defined head and two or four sensory tentacles. Most members of gastropoda will have a shell, which is usually one piece called a univalve, though some, such as slugs do not. Most gastropods' eyes are located on the tips of their tentacles. The gastropods fleshy lining of the shell's inner wall is the mantle. A gastropod's foot is a broad, flat muscular organ used primarily for locomotion, though it varies in the different groups. Gastropod's mainly have bilateral symmetry. Most of the Gastropod's bodily functions, such as respiratory, excretory, digestive, and reproductive are within the mantle of the gastropod. The gastropod's excretory system has two kidneys. A gastropod's nervous system consists of eyes, olfactory tissues and these are most commonly found in the tentacles. As stated previously, most snails have a shell. The shell is attached either by one columellar muscle or a series of muscles. Many species will also have a operculum, which acts as a trap door for the shell. Some marine gastropods will have tubes that extend out from the mantle to gather in food and oxygen. Marine gastropods breathe with gills, but some of them have actually developed lungs. Gastropod reproduction is odd because they are hermaphrodite, meaning that they are a male and female simultaneously. Mollusks tend to have a long mating period or courting period, which also increased the amounts of slime they produce. Both animals will fire small barbed darts that consist of chalk. They are fired by muscle contractions. The mating process then ends with sperm passing between the animals. Then both the animals will lay eggs and after burying the eggs, nothing else will be done with them. Internal fertilization takes place in a some marine species, and is present in freshwater and terrestrial dwellers. Gastropods will reproduce sexually and asexually. All levels of the ocean are inhabited by snails, but most of them are found below the tidal zones where the food is the most abundant. Marine gastropods include herbivores, carnivores, and detritus feeders. Detritus feeders eat decomposing or dead organisms, like a scavenger. Two-thirds of all gastropods live in marine environment while the others are terrestrial. There is an estimated 860 million per square mile on rocky shores. Other than this, scientists know very little about gastropod ecology. This page was last modified on 9 June 2010, at 13:51.